This movie looks just alllllright, but I love the aesthetic of the film, mainly Olivia Wilde’s gorgeous sixties look throughout. Win. Win. Win. 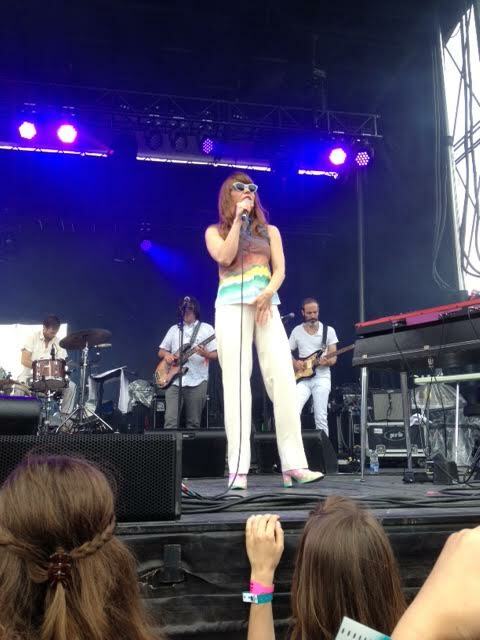 Jenny Lewis’ new album Voyageur dropped yesterday and I have gone Jenny Lewis ga-ga this morning. This nicely timed article written by the cutest boy in the world is also an amazing supplemental piece to boot! Here are a few tunes making my morning followed by a trailer for the film Very Good Girls featuring a ditty written by Jenny Lewis for the film. The film’s Director is Jake and Maggie Gyllenhaal’s mom, Naomi Foner, a friend of Lewis’ and stars Dakota Fanning and Elizabeth Olsen. The love interest in the film is portrayed by Boyd Holbrook, who you may recognize from the TV show The Big C, is actually engaged to Elizabeth Olsen! This year marks Hillside thirtieth year running and while people have grown up it seems very little has changed. Hillside is a unique festival for its relaxed atmosphere, supreme environmentalism, and sincerity. Perhaps Hillside is the anti-festival – leaving the beer pong playing, native headdress wearing Coachella-goers at home. I spent two years of my life living in Guelph in recent times. The city is small (just over 100,000) and a good chunk of the fluctuating population is due to the University of Guelph. The city is sweet, with many local businesses, making it hard for you to walk down the street and not know someone. I left Guelph because I was bored, knowing everyone in your periphery is fun for a bit, but grows a bit tiresome after a bit. 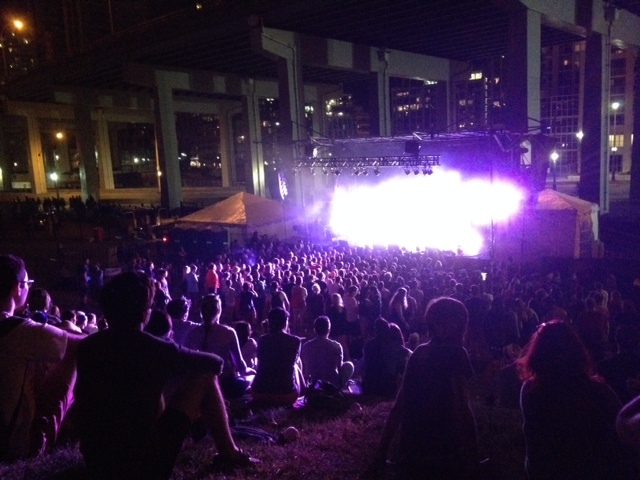 My Hillside jaunt was for the latter half of the Saturday, the second day of the festival. We arrived around 5:00pm missing Bry Webb’s set just an hour before our arrival. We managed to catch bits of Drake guitarist Adrian X, Danny Michel, and Spirit Family Reunion. This year oddly enough wasn’t about music, but much rather the people that I was with. In my three years of attending Hillside, I always took advantage of the yellow school bus service they offer to the festival from the downtown core or drove in, never camped. It seems that part of while people love to attend and volunteer with Hillside is the overnight scene. Volunteers congregate in what they refer to as Volly Village, conveniently located just five minutes from the festival grounds. I’m so happy my two favourite goofballs have reunited to put together this short, silly segment spoofing the National and Tom Berninger’s wonderful film, Mistaken for Strangers. Great to see these dudes were able to play the festival’s main stage. They had a fantastic mid day set that managed to get people at the back of the theatre to stand up and dance. 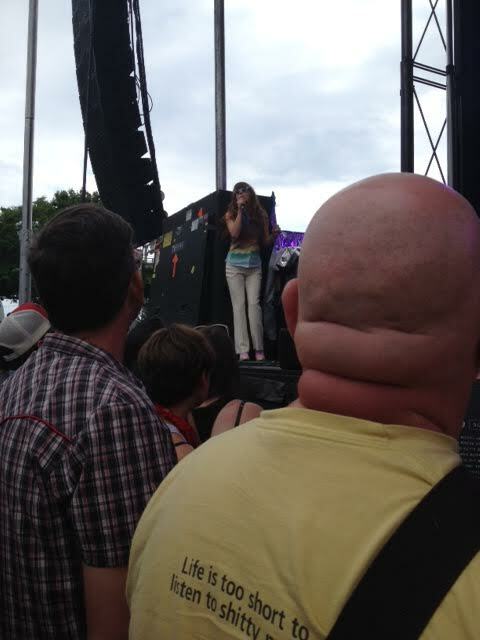 For those of you who hang on to my blog with each post: you know my experience seeing Neko Case in her home state, Washington. Elle writer, Hilary Hughes, gushed that Case’s set was one of the highlights of her year in live music. I’m not sure if I’m with her 100% there, but it was a lovely time. It’s going to take the most intimate of intimate Neko Case shows to top her Trinity St. Paul gig of 2009. The Toronto Urban Roots Festival (TURF) title is misleading, as inserting the word “urban” into any festival title gives it an odd connotation. Festival founder Jeff Cohen said they considered using the more fitting word “indie” in the title, but felt the name would be too close to another landmark cultural hub in the city, TIFF. Jargon aside, TURF is now in its second year as a Toronto born and raised festival showcases some of indie rocks biggest darlings. Cohen, the festival’s father, whose day job last weekend at the festival was to introduce the bands with complimentary banter, is part owner of the Horseshoe Tavern, Lee’s Palace, and concert promoter Collective Concerts. As you may or may not have noticed, Toronto has accumulated a few new locally grown weekend-long festivals in the city over the last two years, namely Field Trip and the Toronto Urban Roots Festival. Cohen has worked very hard to ensure that Toronto remains a large music hub. Cohen serves as the Ontario Ministry of Sports and Culture, as well as a stakeholder for the Ontario Music Fund he has developed a strong voice in the scene. I praise Cohen and company for the amazing music they have brought to Toronto in the two years of TURF’s run. Apparently, Toronto will be hosting the Chicago-based festival Lollapalooza, which will make for greater competition in terms of locking down festival acts and certainly upping the ante for festival standards. TURF was fairly well organized with three stages across half the space Field Trip occupied with only two stages. 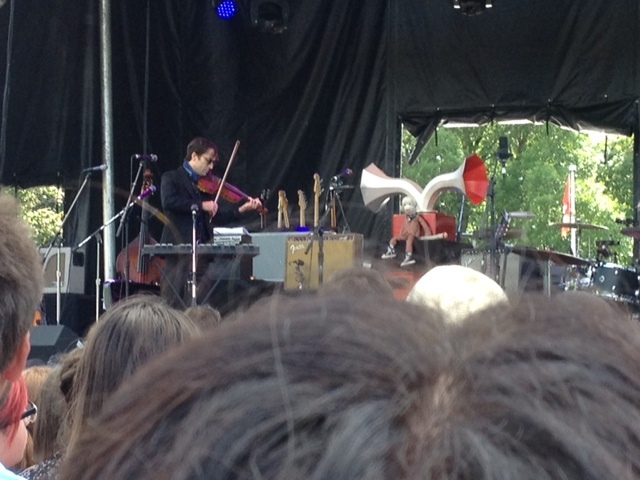 To my surprise, big deal acts such as Jeff Tweedy (of Wilco), Jenny Lewis (of Rilo Kiley) and Andrew Bird, played the festival’s West End Stage – a smaller, less used side of Fort York. An even smaller stage was used in a very unsuspecting gully tucked away just south east of the main festival area. The gully made for a beautiful theatre-like setting for people who preferred sitting with perfect sightlines. Smaller acts such as Hollerado, Deer Tick, Joe Pug, and Pokey Lafarge lit up a very unsuspecting space that looked onto the large highway poles and Fort York Boulevard. Much to my surprise, Friday’s acts started early in the afternoon with Tift Merritt – a likely poorly attended first act due to normal nine-to-five work schedules. 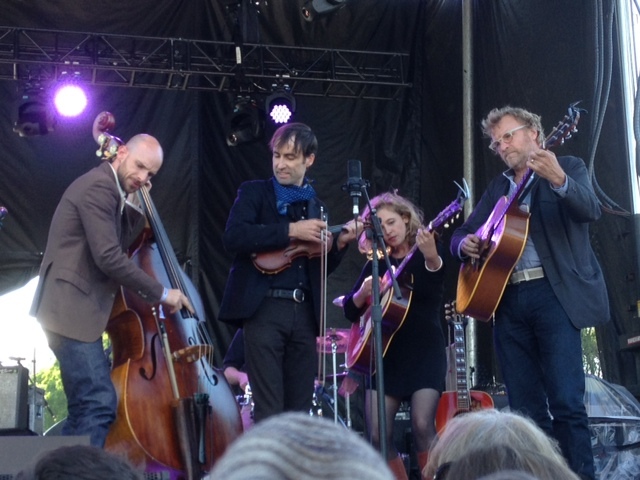 In working a nine-to-five work day, I wasn’t able to make it down for Merritt’s set, however I fortunately was able to catch her playing as a part of Andrew Bird’s band called Hands of Glory. Bird stepped on stage just past five to a bright sunny afternoon sky and the commuter trains whipping back and forth on the Lakeshore line – very appropriate to the Hands of Glory’s rustic-style country sound. Bird played alone for two songs accompanied only by the spinning speaker horn – an instrument that makes Bird’s live performances a unique, lush experience. The other standout performance from Friday was the New Mexico native Paris, France transplant, Beirut. In 2001, at the tender age of twenty-five years old Beirut aka Zach Condon released three very strong albums. It’s been three years since Condon’s released anything, but just playing a set drawn from dated material was tremendously well received by the crowd. 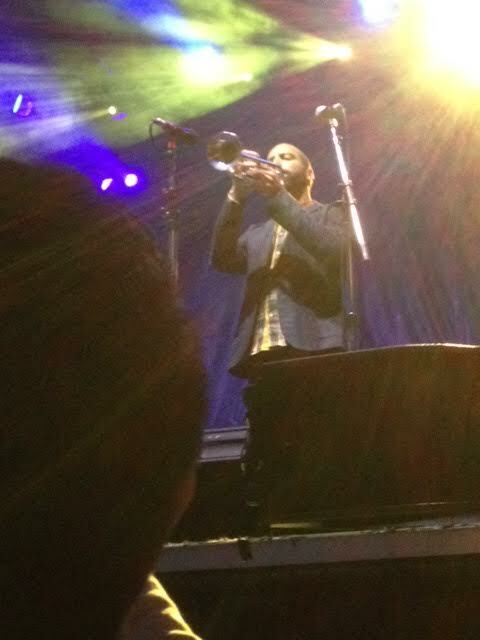 I was surprised to find The National’s horn section – multi-instrumentalist Ben Lanz and trumpet player Kyle Reznick – to also play with Beirut. Apparently, their permanent members of Condon’s band, a title they have yet to receive from the National. I am constantly surprised by Beirut’s ability to capture mainstream success. With crooner-style vocals and an eastern European musicality, I don’t exactly get the band’s vast likability. Perhaps, it’s Condon’s boyish good looks, or the sweet lyrics. 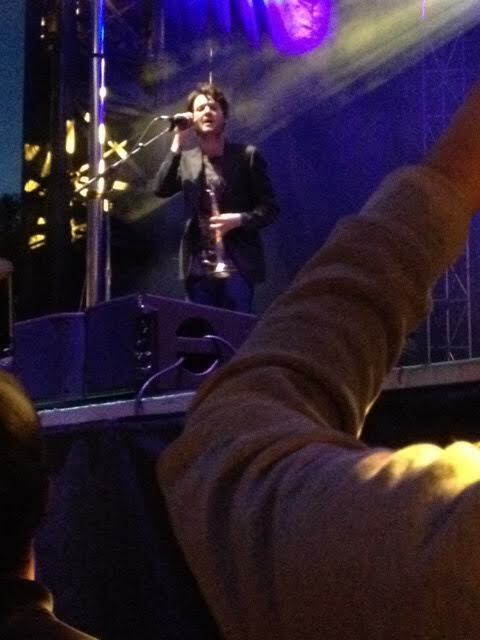 This marked my third time seeing Beirut and second in Toronto – all received by large, dedicated fans. 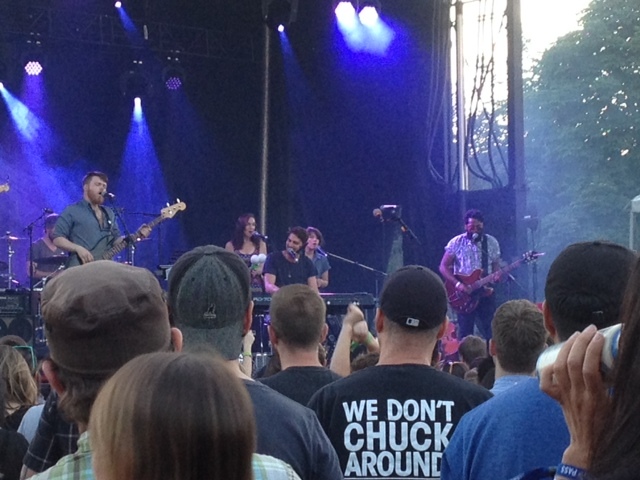 While the band was spot on, Condon seemed to be a bit out of it. Delayed vocals, a polite ask for a drink mid-set – something seemed a bit off with the guy. 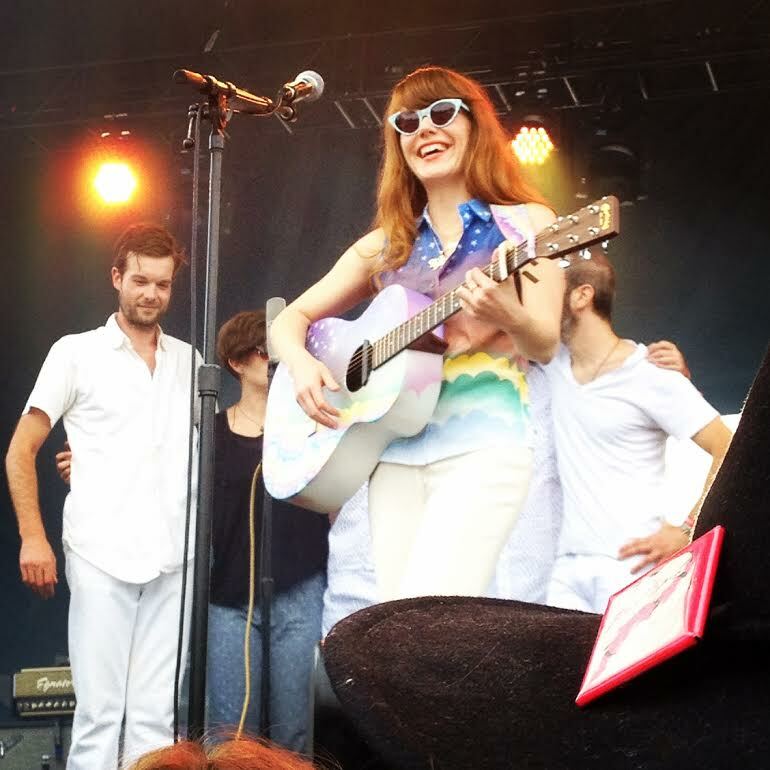 Sunday started with Jenny Lewis, in my view, was the finest set of the festival. Lewis, at the ripe age of thirty-eight, looks and acts as young as the first time I saw her eight years ago (!!!). This Toronto stop was in support of her new album The Voyager produced by heavy weight Beck Hansen (aka Beck) and is to be released later this month. Beyond playing the tunes, she embodied the album in her physical attire – an airbrushed, magic pony-like design complete with stars and rainbows. She wore this design on her t-shirt complete with white pants and matching designed boots and nearing the end of her set, she whipped out a matching guitar. Very aware she was over the top Lewis acknowledged that she resembled an adult clown. Tweedy, comprised of Wilco’s Jeff Tweedy and his eighteen year old son Spencer Tweedy on drums, plus a full band played shortly after Lewis. As one of the more established acts at the festival there was a sense of comfort and ease in the band’s performance. I’m not much of a musician, but Spencer Tweedy sounded excellent playing tunes from the forthcoming album Sukierae under the moniker Tweedy. Tweedy made small talk about playing with his son saying that with solo albums the artist is expected to play all the instruments, Tweedy continued to say that this album has been eighteen years in the making in growing his son. I’m sure this has either become or will become the regular banter, but it sure was sweet. Part way through the set Tweedy acknowledged the band’s presence before the start of the tune “Low Key” by detailing the band’s pre-show ritual of a communal shrug. Again, more catalogue banter, but ever so endearing. 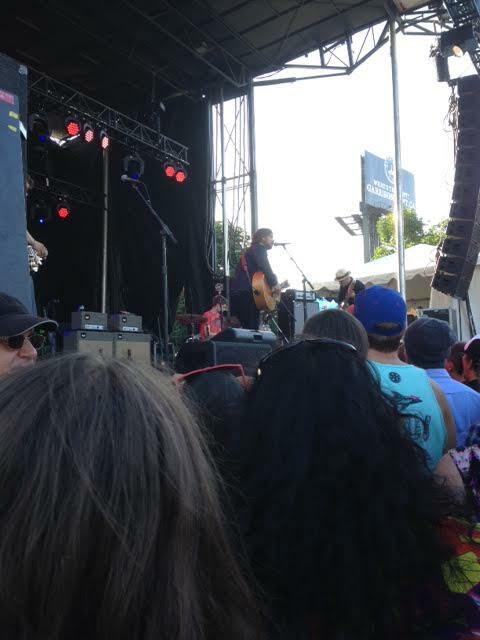 Neutral Milk Hotel closed out the festival’s main stage to a very mixed audience. 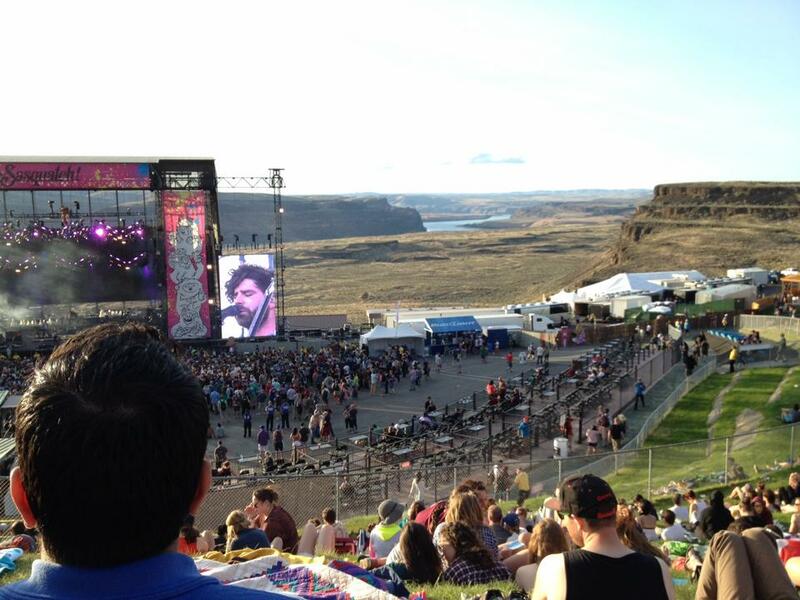 Standing in the VIP area, fans were physically there, but not mentally there. I’ll be the first to admit, hanging out at a festival for three days is challenging and surviving one day is a great feat. Sadly, with such a niche band like Neutral Milk Hotel, I had high expectations for the gig based on my past experiences seeing the band, particularly the crowd. Much to my disgust, the crowd was filled with people talking over the set and countless comments about the band’s dorky appearance. The band was in good form in terms of spirits and sound. At the beginning of the set Mangum politely asked the audience to put away their cell phones… A bit reminiscent of this TURF’13 moment. Nearing the end, I felt grumpy and ready to head home. I was pleasantly surprised by the Ottawa band Hollerado’s energy and enthusiasm closing out the festival at the smallest stage. It was my first time really soaking in the band’s sound, nothing I’d really take home and listen to. They managed to win my heart over with their sheer excitement and ability to genuinely hang out with the crowd. For the band’s final song, singer Menno Versteeg asked the audience if anyone could play guitar and quickly added on anyone who knew the final song. He called one of the few eager fans who admitted to both knowing the song and being able to play the guitar to the stage giving him his guitar. Versteeg proceeded to sing sans guitar. A really great pick-me up to the very underwhelming Neutral Milk.